We're excited to begin fall work on the improvement of Hole #9 and our driving range. As part of our Master Plan of course improvements hole #9 has been earmarked as a priority in achieving our long term vision. Our Master Plan, prepared by the architecture firm, Herfort/Norby, focuses on the following: improving playability, creating a fun and challenging layout, addressing safety concerns and improving course conditioning. You can view the plan by CLICKING HERE. Hole #9: The main focus of this hole is the complete rebuild of the teebox complexes and realigning the fairway to the right to make the hole more playable and shift it away from the #10 hole. The teebox rebuild will be in a modest “staggered” fashion to allow our guests to aim a little more down the left side to accommodate a left to right shot pattern. The hole will remain a slight dogleg left, but with some modest tree removal on the right side of the fairway will make the hole much more playable. The tree removal will also improve turf conditions and allow for a new cart path to run ¾ of the length of the hole. A new target bunker will be repositioned down the right side just in front of the existing bunker. Driving Range: With an increasing trend of driving range usage it has become necessary to expand the usable space of the range. Currently, the back 1/3 of the range is too severely sloped and doesn’t drain properly. This will be remedied by bringing in fill to level the back of the range and to modestly increase its’ size. New target greens will also be constructed to aid in practice. When completed we hope you will enjoy these improvements! As always, we thank you for your support! ariety of top brand merchandise, including Ashworth and Greg Norman apparel, Ping, Callaway and Titleist equipment, in addition to many other items you will need for your golfing experience. "We've found that when people come to the lakes area for vacation and play some golf, they sometimes like to take home a pleasant reminder of their experience. We have a wonderful selection of sweatshirts, shirts, hats, and other souvenir items," Bengston said. Whitefish can also custom order any product that you need. So, if you're looking for a great deal on the newest piece of equipment, give Whitefish a call! Want to sharpen your game? Need to warm up those muscles before hitting the course? 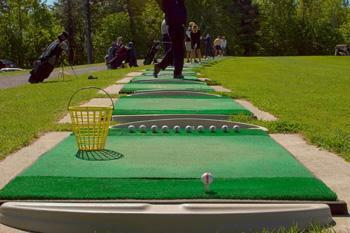 Whitefish has a driving range, a practice green, and sand bunker. 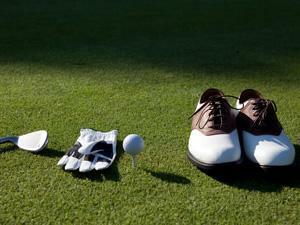 Everything you need to keep your game in top form is conveniently available to all our patrons. And golf lessons are also available, call the Pro Shop to set-up your lesson: (218) 543-4900 or visit our Lessons page. Is there anything better than your favorite beverage served with a juicy hamburger after an enjoyable day on the course? The folks at Whitefish Golf Club don't think so, and they're sure there's no better place than Bogey's Bar & Grill. You will enjoy a comfortable up-north décor in the Grill and if you would like to sit outside you can enjoy the beautiful views of the course. 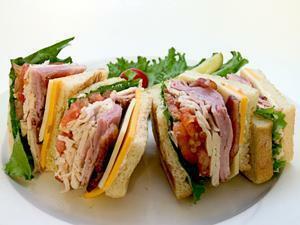 No matter what your pleasure you will find Bogey's Bar & Grill a pleasant place to unwind. "We have a nice variety of items on the menu," said General Manager Steve Bengtson. "From hamburgers to chicken sandwiches, appetizers, soups, salads, and daily specials, Bogey's Bar & Grill can cater to the varied appetites of golfers. We also have full bar to handle any beverage needs a person may have." And if you can't wait for your round to finish, "We have a phone at the 9th tee so you can call in your order as you make the turn," Bengtson said.